"With its innovative, inclusive and open-access philosophy for science, OCEARCH is breaking through old, bad habits of scientific territoriality and the plodding pace of academic research. The result is a revolution in our approach to contemporary science, providing urgently needed applications for conservation, resource management, education and public safety." 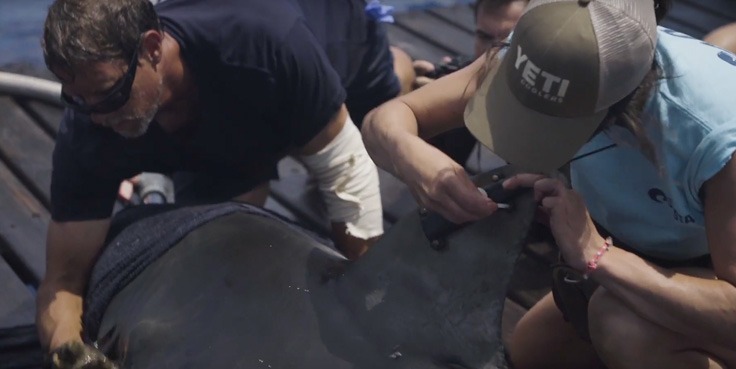 "With its innovative and open-access philosophy for science, OCEARCH is breaking through old, bad habits of scientific territoriality and the plodding pace of academic research. 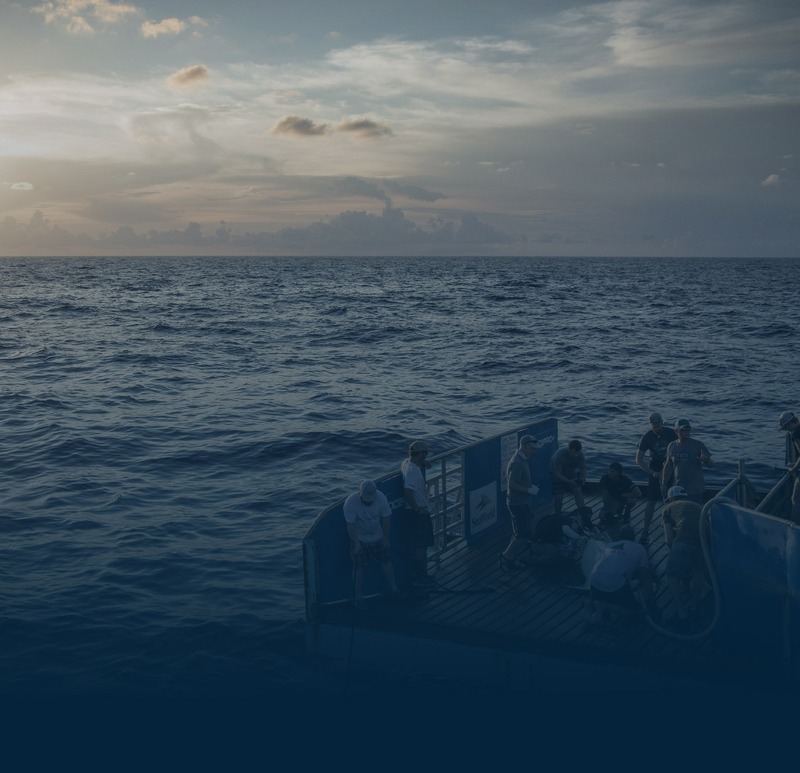 The result is a revolution in our approach to contemporary science"
OCEARCH conducts research expeditions aboard the M/V OCEARCH, which serves as an at-sea laboratory. The M/V OCEARCH contains a 75,000 lb. capacity hydraulic platform designed to safely lift marine animals out of the ocean for access by a multi-disciplined research team. Devices capable of real-time tracking of fine and broad scale movements. 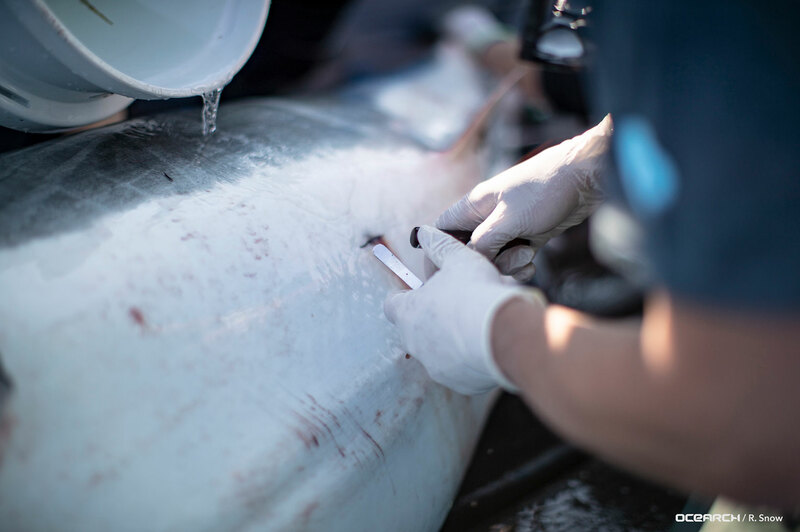 Critical to understanding reproductive statuses of a sharks and stress levels the animals go through during the capture and tagging process. Used to record fine-scale swimming behavior including how quickly white sharks recover after tagging. used to assess the reproductive condition and status of females. The equipment includes special goggles enabling visualization even in bright sunlight. Collected to determine the population connectivity (relatedness) and dispersal of white sharks for the development of a population management plan. Help identify critical reproductive habits, examine diet and assess contaminant loads. Collected from the oral cavity, gills, flanks, and cloacal region of the sharks. Taken to determine size and compare them to other sharks with the same or different reproductive maturity. Also used in estimating weight and age at maturity. Non-real-time tag used to track movements and depth/temperature profiles. Small sound-emitting devices that allow for receiver-dependent tracking of sharks in multiple dimensions. Bacterial samples are taken to study and address the bacterial roles in shark’s rapid rate of wound healing and as a novel source for antibiotics. Collected to assess the sperm motility, viability, and morphology of a shark. This not only adds to the health assessment, but also predicts sperm maturation and time for breeding. 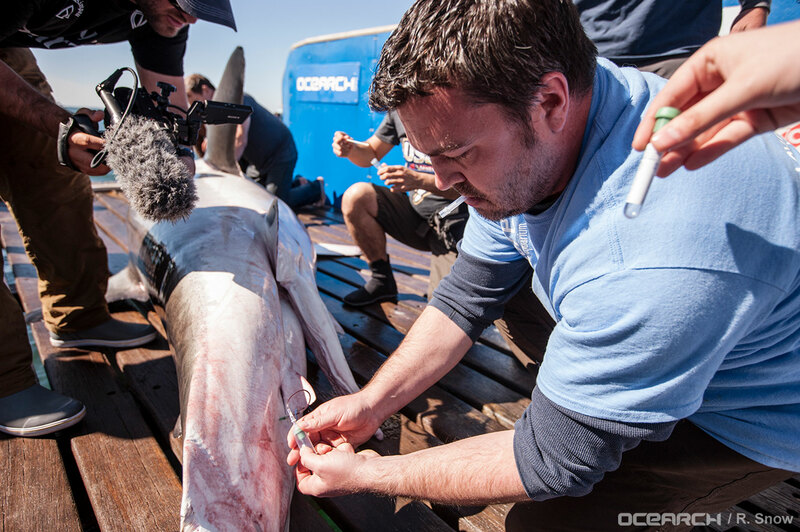 What is the OCEARCH process for tagging a shark? Can you successfully obtain the necessary amount of data from an alternate means of study? No, the technologies and methods used represent the least invasive means of obtaining the data necessary to fill knowledge gaps regarding sharks. The majority of studies conducted on each shark could not be conducted on a free-swimming shark. What type of samples do you collect from sharks? Sharks are measured and sexed. Samples such as tissue, blood, fin clips, bacteria, sperm, and parasites are collected. What type of studies do you run from the samples? Many studies are run using the samples collected, including the assessment of the reproductive condition, reproductive cycle, genetic analysis, diet using stable isotopes and fatty acids, gestation period, inorganic and organic contaminant loads, the fecundity of white sharks in the Atlantic Ocean, studying parasite species presence, abundance, and infection sites in white sharks. events and giveaways sent directly to your inbox.